Disneyland can be overwhelming to plan for if you have just one day to see everything. Here is a sample itinerary of making the most of your time at the park including rides, shows and where to eat. Even with the most careful planning, it’s impossible to ride all the rides and see all the attractions, so think of this as a highlight reel of the most popular sights. Of course feel free to substitute this Disneyland itinerary with rides that are more your style and that suit the personal tastes within your group. The biggest piece of advice is to arrive at the park right when it opens (or before if you’re staying at one of the Disneyland hotels). The weather will be cooler and you can enjoy the park when it’s a little less crowded. It will be a long day, but you can always do low-key activities after lunch to rest up a bit. Disneyland park hours can change depending on the season, so be sure to check them before you go. Another important thing to do is to download the Disneyland app before you arrive, since it will allow you to see wait times for rides, locate characters, and find food. It also allows you to purchase your park ticket and download it to the app, enabling you to skipping the ticket line and go straight to the entrance gates. Seriously a lifesaver. 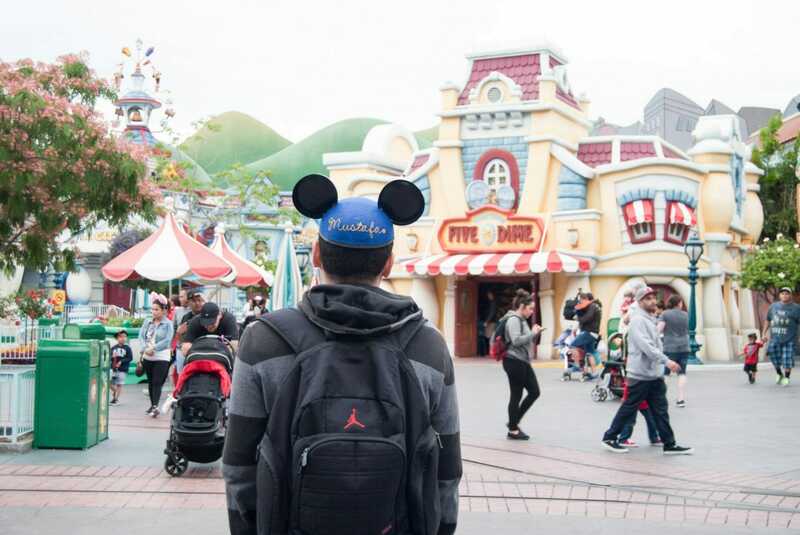 This itinerary is created for a less crowded day at Disneyland and is not applicable for those almost-to-capacity days like during summer and holidays, so take this into consideration. Especially during the holiday weekends during Halloween Time and Christmas, you will have to cut your schedule in half and endure crowds that are not for the faint of heart. Start your day out with one of the best views in the park: the patio at River Belle Terrace in Frontierland, with scenic views of the Rivers of America. Indulgent options include the cinnamon roll French toast, biscuits and gravy, and a Mickey Mouse pancake for the kids or kids at heart in your group. If you have small kids, Goofy’s Kitchen in the Disneyland Hotel has a character breakfast and is always a hit with the little ones. It’s pricey, but it’s buffet-style, and there are also great food choices including a make your own omelet station and the classic Mickey pancakes and waffles. There is also a character breakfast with a buffet at the Plaza Inn if you want to get breakfast within the park. Once you’re in the park, make a beeline for Space Mountain in Tomorrowland to pick up a FASSPASS (FP). This ride is one of the most popular and can run out of FP later in the day. Then head to New Orleans Square and go straight to Pirates of the Caribbean, which doesn’t have a FP option, and can get quite crowded later in the day. Afterwards head next door to Adventureland and get in line for Indiana Jones. Stop by the Tiki Juice Bar for a mid-morning snack of heavenly dole whip and have one person in your party run out to get FP for Matterhorn Bobsleds for your entire party (make sure they have everyone’s park tickets). You can get a new FP once you are done with the one you currently have, or within a two-hour period. Once you’ve secured your Matterhorn FP, make your way to Critter Country to wait in line for Splash Mountain. Pro tip: the closer you sit to the front, the wetter you’ll get. Make sure to also pose for the camera at the top of the drop! If you have smaller children, forgo the faster rides in the morning for something a bit more kid-friendly like Toontown, where you can meet Minnie and Mickey in their respective houses. It’s also a fun town to walk around in and admire all the details. Before lunch, make sure to get a Haunted Mansion FP for after you eat. Café Orleans in New Orleans Square is a solid choice with Monte Cristos, mint julups, and Mickey beignets. Grab a seat on the patio, a perfect spot to people watch. It’s highly recommended that you make reservations if it’s a busy season, but you can also just walk in as well if you’re not sure what time you will be having lunch. For a fancier option, the Blue Bayou Restaurant has similar items on the menu, including the Monte Cristo as well as dishes like Surf and Turf, but is set next to the Pirates of the Caribbean ride. The dinning room feels like you’ve been transported to an evening on a bayou, and is a memorable experience for the ambiance and a great break from the heat and crowds. Reservations are highly recommended as spaces fill up quickly. Disneyland naturally tends to be more crowded in the afternoon, so plan accordingly for crowds and heat. After going on the Haunted Mansion, get a FP for Big Thunder Railroad and then head to Tomorrowland and wait in line for Buzz Lightyear Astro Blasters. Thought if you want something a bit slower, heard to Main Street, where you can explore attractions like Great Moments with Mr. Lincoln and the attached Disney Gallery, Tom Sawyer Island in Frontierland, or a ride on the Disney Railroad that takes you around the park. Disneyland is known for its heavy junk food, but the Bengal Barbeque in Adventureland has relatively healthy choices that include meat, and veggie kebabs. For a heartier and more scenic option, The Plaza Hotel is worth stopping by for its famous fried chicken platter and ornate Victorian interior. After dinner, make your way to Fantasyland to experience low-key rides like Peter Pan’s Flight, Alice In Wonderland, and Storybook Land Canal Boats (especially pretty all lit up at night). If you have the stomach for it take a whirl on the Mad Tea Party ride, but if you want something slower the classic ride It’s A Small World should be right up your alley. The classic Fantasmic! firework show is not to be missed, and you can actually get FP for either one of the nightly shows. There’s also rotating seasonal Disney fireworks every night. For Summer 2018, the show is Together Forever-A Pixar Nighttime Spectacular. It’s important to note that shows can get canceled due to weather conditions. Make sure to grab one of Disneyland beloved churros at carts scattered around the park, right before a show. There’s nothing like having a warm churro in your hand while watching the fireworks. The way those churros are crunchy on the outside and soft inside with the perfect amount of cinnamon sugar, makes it one of the ultimate Disney treats that you should not miss. After the fireworks, get in line for Star Tours, which has been updated to includes scenes from the most recent movies The Force Awakens and The Last Jedi. The wait time is much shorter if you go when everyone is still out by the Rivers Of America or near the Cinderella castle. On your way out stop along Main Street to pick up souvenirs and treats. Emporium is the largest gift shop and has an extensive array of collectible items to browse and buy. Make sure to stop by Candy Palace to take care of all your sweet tooth cravings, including Mickey-shaped rice crispy treats, caramel apples, and cake pops. There is the trio of Disney hotels: the Disneyland Hotel, Paradise Pier Hotel, and Grand Californian Hotel, but if you are looking for a more moderate price range these are great alternatives that are close by. If you don’t have a rental car, ride shares like Uber and Lyft are great options for zipping to and from the park. A 15-minute walk to Disneyland (you can see Disney California Adventure across the street), this hotel is a clean, spacious home base. The area is well lit, so you can feel safe coming home from the park late at night. The pool area is a nice retreat with two large pools, two hot tubs, and shaded cabana areas. A hot breakfast is included. A bit further from the park, this 3-star hotel is modern, clean, and offers spacious suites complete with modern kitchenettes. A reasonably priced option for families or travelers looking to have the convenience of a fridge, microwave, and stove top in their rooms. Walking to the park is a bit far (25 minutes or more), but a blink of an Uber ride takes you straight to the front gates. A mid-range hotel that is a solid choice with amenities that include an outdoor pool, snack bar, and a complementary hot breakfast buffet. Suite rooms include a separate living room area with a sofa pull-out bed, that is perfect for larger groups. Ask for a back-facing room to avoid highway noise. Disney is a quick 11-minute walk door to door. What is on your 1-day Disneyland itinerary?